Can you hear it speaking to you? Check out the thickness of that butcher block. Admire the galvanized shelf, body and drawer. Even the backside is amazing. This is the piece I spoke of in yesterday's post. It is 5' long. 2' deep. 2' 9 1/2" tall. What do you think it did in it's first life? What would you do with it now? My plan is to sand down the butcher block top just a bit. I've heard some bleach could help. Then I've heard about a butcher block restorer. Someone else suggested bri-wax. Do you have any experience with such beauty? Wanna see more pics? Click HERE. Soooo, was it worth the wait? For the record. I do intend to pretty this up and then sell it. While I like it plenty, I don't have the space or need for it. Wow what a great find. It speaks volumes and has many new chapters waiting to be written. Thank you for sharing this beautiful find. Love your blog it is awesome ! Now THAT is a garage sale find! I don't know anything about restoring it. 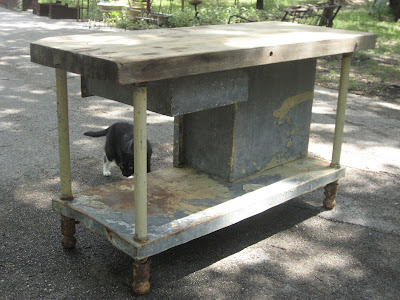 It would be amazing as a kitchen island, a bathroom vanity, or a craft/work table. Fabulous!! Hi Mindy, LOVE your galvanized butcher cart. I can see why you heard it calling! I especially loved the cat ON the butcher block in your flicker photos. They have to "conquer" everything new. Jan from Leola's told me you asked about me. Thanks for thinking of me. It's been a rough spring health wise, but I'm better. Hope you had a great trip to the Ozarks. I would have loved to have visited with you and David. I live vicariously thru you, the Theresas, and Debbie. I feel like I know you all because I'm a regular on all the blogs! Take care and have a great opening at W@T's next weekend! Love it! 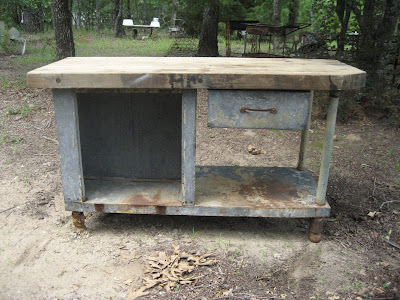 Would use it as a kitchen island! Don't do the bleach thing. I have tried that. It bleaches all the way through. Try a light sanding and a little tung oil! Oh ya baby-that is speaking to me. It is saying, "Becky, tell Mindy to roll it your way to Montana." 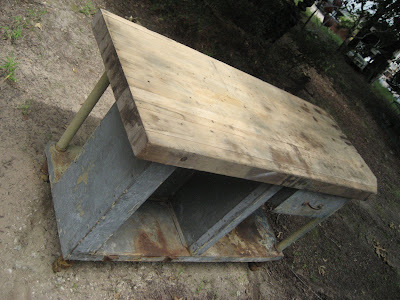 I think it was an industrial kitchen island. Oh Ya baby, I can see why you heard it calling. I hear it saying, "Mindy, roll me on up to Becky in Montana!" Big honking wood like that!!! Um, really, the wood. Did that come out alright? It has a lot of potential. I'd probably hit it with a sander, give it a good scrubbing, apply Johnson's paste wax, then use my handy dandy polisher to buff it out. Martha would probably tell us different! Mindy, It didn't talk to me. It screamed! I LOVE it!!! I've been trying to educate myself on butcher block care via Google. It seems that Old Crow Farm is on the right track with the mineral oil. They even sell food grade mineral oil for this very purpose. I had no idea. I also read that stains can be cleaned with lemon juice. Good Lord, I might even tear out my current island for something like that!! Sorry Maggie. I'm gonna need something to put my Cabbage Patch Dolls and Billy Beer on! 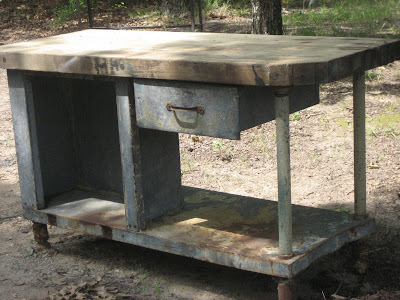 I'm thinking this would be great to use in an outdoor kitchen. The butcher block top can double as a prep area and a serving area. The drawer would hold utensils, napkins, etc. The storage underneath would look great stacked with enamel ware for serving. If possible, add a shelf to the large compartment for stacking plates. Add a towel bar to the end and hang cute kitchen towels (I'm partial to red checkered). It would be too cute. If I didn't already have my 20' X 52' patio crammed full, I'd buy it in a hearbeat!! It's great! It's really, really great! I'd probably hose it down and call it a day!